"On behalf of the Trailer Life Directory, I want to extend our congratulations to you on your acheivement as one of top-rated Parks for 2009." Pacific Border RV Park is located at the Pacific border crossing southeast of White Rock, BC, Canada. Our campground is a beautiful park with immaculate facilities close to six golf courses, delightful beaches, shopping and the US/Canada border. Surrounded by mature woods containing a variety of natural floral and woodland animals, we offer a combination of "on-the-spot" activities; proximity to plenty of shopping venues (the U.S., Langley, Surrey & the Vancouver mainland); interesting places to visit, such as Fort Langley; three local casinos and balloon rides. Our landscaping is well-designed and immaculately maintained. Vancouver is surrounded by water on three sides and is located between the Pacific coastal mountains and the Pacific Ocean. Often referred to as the Lower Mainland, Vancouver is home to spectacular natural scenery and a bustling metropolitan core, and boasts one of the mildest climates in Canada. 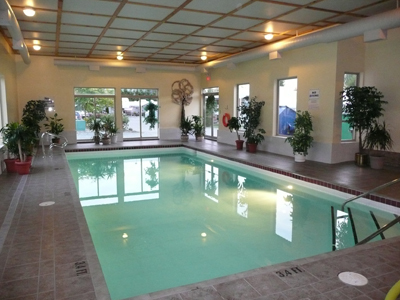 With 50 & 30 amp power, heated indoor pool, laundry facilities, library, HIGH SPEED wireless internet and monitored video security, we are definitely the BEST of the BEST of RV parks for anyone looking for a campground in the Vancouver Lower Mainland!